Top dress in Spring and Fall with approximately 1/4″ of Mushroom Compost. Flower and Vegetable Gardens: Spread Mushroom Compost two to three inches deep over garden and till to a depth of six inches prior to planting. Shrubs, Trees and Evergreens: Mix one part Mushroom Compost and one part existing soil. 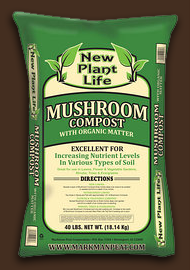 Increase to two parts of Mushroom Compost to one part All American Top Soil if existing soil is poor. Top Dressing & Reseeding Existing Lawns: Use All American Top Soil right from the bag and spread evenly. After broadcasting seeds, cover lightly with additional top soil, spreading evenly 1/2 to 1/4 inch deep. Shrubs, Trees, and Evergreens: All American Top Soil can be used straight from the bag for planting all outdoor plants. However a better planting medium is obtained when mixing 1 part All American Composted Manure, 1 part All American All Purpose Peat and 2 parts All American Top Soil. Using this mixture place 4 to 6 inches in bottom of hole. Position tree, shrub or evergreen, then use same mixture to finish filling hole to proper level. Water plants immediately and refill any area that settles. Entire website and contents ©2016 Markman Peat Corp. Information included on this website is subject to change at any time. Markman Peat™, and New Plant Life™ are registered trademarks of Markman Peat Corp. of Le Claire, Iowa. All rights reserved.